This whole thing fell to luck, really. 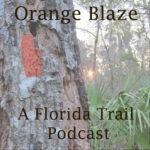 I happened to check my email in Orlando when we were on the Florida Trail and see an email from a woman who said she was with Woman’s Day magazine. 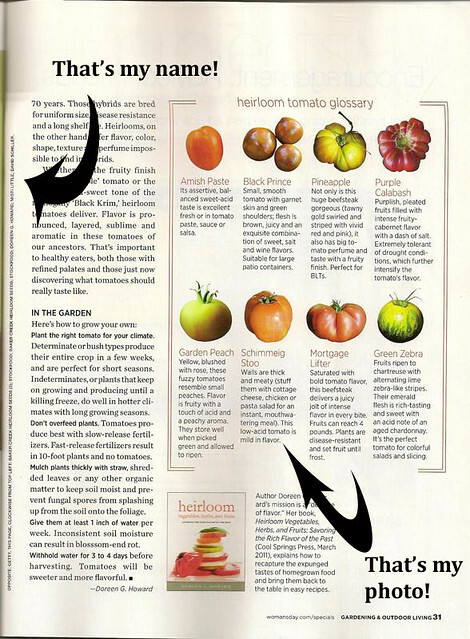 Apparently she’d found a photo of a tomato of mine from a few years ago and wanted permission to use it in a special issue called Woman’s Day Garden and Outdoor Living. I was a bit suspicious so I did some Googling and found out that she was completely legit. I figured she might need a full res photo or something so I emailed her back and gave her my number since I didn’t know the due date and the specs for it all. Thankfully she called me that night in the hotel because the due date was the next day! Luckily she didn’t need a full res image and could pull it from the internet. I’d kinda forgotten about it until we got back and we thought it was due to be out earlier in the month but I found out it was supposed to be late March instead. Yesterday we got a call from Chris’ mom that she saw it but wasn’t sure which photo was mine. Chris and I tracked the magazine down at Walmart and I found it! Not how I figured it would be used, but I’m going to be paid for it so I don’t really mind! Here’s the original photo in my Etsy shop. I wish I could tell you I had some seeds to sell to you now but they are still in storage. I will definitely be doing more ‘tomato portraits’ in the future and hey, now I’m published! heh! Thanks Woman’s Day, you can call me any time to use more photos! Don’t forget to schedule a portrait session with me in March or April for portfolio building rates! Congrats!!!!!!! I love, love, love seeing my name in print for work I did. I’m going to have to go look at the Woman’s Day magazine and see yours! So happy for you!